Like many ‘Yogisms’, this statement is both oxymoronic and, yet, in a sense absolutely true. Having an idea of where you want to go is great, but it isn’t the same as knowing where you are going. Many investors can articulate where they want their portfolios to go, but very few can follow the directions to get to their destination. And it’s this lack of knowing that often leads them somewhere else. Yogi’s statement is touching on that deeper, more significant point (or so I am claiming…work with me here). It’s like the difference between natural flavors and natural ingredients: subtle, but important. In today’s economic environment, more than ever before, it’s important to know where you’re going. One of the core principles of our investment philosophy is that we look forward, not backward. And while this sounds pretty cool, and most everyone would agree it’s a good idea, very few people actually follow along. Most individuals prefer to look backward, at what has worked well over the past 5, 10, or 15 years. Picking investments that have performed well in the past is a very satisfying exercise. It’s pointless, but very emotionally fulfilling. In fact, it’s worse than pointless – it’s downright dangerous. Like driving down the freeway only looking in the rear-view mirror, you won’t be able to avoid the crash ahead. But having said that, it is sometimes informative to review the recent past. Knowing where we’ve been can help explain where we are and, most importantly, where we’re going. Below is a chart provided by our friends at Research Affiliates. 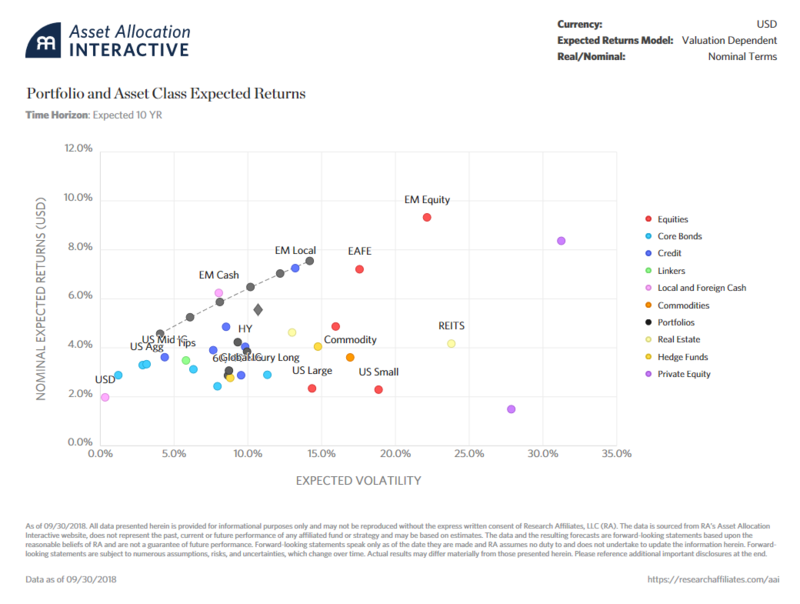 It shows the returns of various asset classes over the past 10 years. There are two things to note here. First, US stocks (US Large and US Small – red dots) have been the best performing asset class over the past 10 years by a significant margin. They have produced double the returns of both International (EAFE) and Emerging Market Stocks (EM Equity). This is not a trend that is likely to continue much longer. Secondly, every asset class on the chart (with the exception of Commodities) has had positive returns over the past 10 years, with a traditional portfolio (“60% stock/40% bond”) returning nearly 10% annually. Incidentally, over the past 10 years pretty much everybody who invested money has had positive returns on their investment. In behavioral finance terms, the previous decade could be a recipe for disaster. Universally positive returns lends itself to a false sense of confidence among the masses. Individual and professional investors alike may be lured into thinking they understand the markets and economy better than they actually do. This can lead to unbridled risk-taking and a tendency to delay portfolio adjustments (I’ll return to this in a second). Secondly, returns in excess of what is justified by economic growth means future returns are likely to be less attractive. Global growth has been in the low single digits for the past 10 years and is expected to remain there. At the same time, most asset classes have yielded significantly higher returns than economic growth would justify. 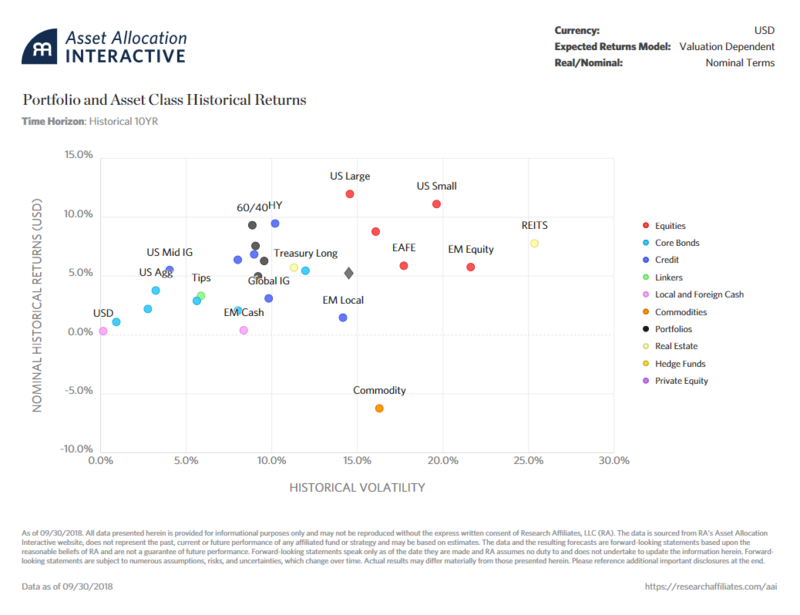 Hence, many of these asset classes should be poised for lower returns going forward. Returning to our friends at Research Affiliates, we look at their expected returns over the next 10 years. The values are based on various fundamental metrics that are highly correlated with future returns. Keep in mind these are not short-term projections but rather annualized, long-term projections. Significantly, the cluster of expected returns are considerably lower than the past 10 years. A “60/40” portfolio is expected to return slightly less than 4% (as opposed to 10% over the past 10 years). Even more significantly, however, are the expected returns on US stocks. In contrast to the high returns of the previous 10 years, US stocks are likely to be one of the worst performing asset classes going forward. Remember what I said about delaying portfolio adjustments. Despite abysmal expected returns, the likelihood of investors selling their current holdings of US equities is nonexistent. It’s probably less than 1/1024th, if you know what I mean. Certainly not something you’d bet a million dollars on. And yet, for those who don’t want to end up somewhere else, they had better pay attention to the directions. Following directions isn’t always easy, especially when your wife wants you to. But ignoring the road signs on the way to your destination is a sure-fire way to end up somewhere else. At Plan Financial, we take into account all the relevant data (directions) to help our clients reach their destination. It isn’t just about identifying ‘cheap’ assets and selling off ‘expensive’ ones, but that is one important signal to keep in mind. Thankfully, there are asset classes and economies across the globe that will provide safer, smoother roads going forward. But today, the US equities freeway is looking rather jammed up ahead. It might be time to take the next off ramp…before it’s too late. Next Next post: Halloween May Be Gone, But The Zombies Are Still Here!